A view of San Pablo from Tempe Butte looking to the southeast. In this c1900 photograph Old Main appears at the right center. Knowing Tempe’s founding is virtual required reading for anyone who lives here. Charles Trumble Hayden (Don Carlos) establishes a ferry service at the base of Tempe Butte in 1871 ultimately creating a dynasty that included a flour mill, land investments, freighting, commercial businesses and a son Carl who became at the time the longest-serving Senator is U.S. history. And that Englishman, “Lord” Darrell Duppa is credited with naming the new community “Tempe” for the Butte’s resemblance to the Vale of Tempe in Greece. Now legendary, these stories are all essentially true. But there is more to Tempe’s formative period than most appreciate. For example San Pablo and the Hispanic influence. 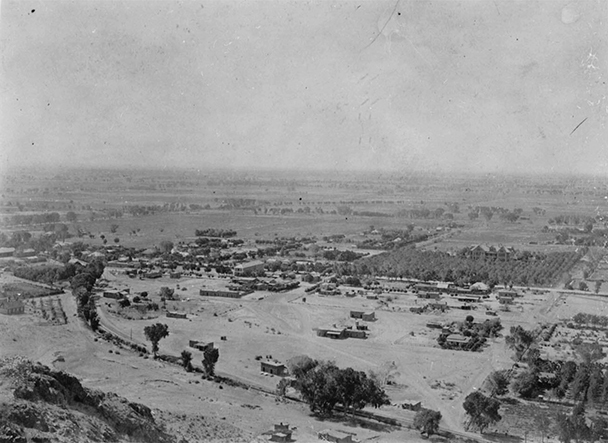 Even before Charles Hayden surveyed the nearby countryside from atop Tempe Butte, Hispanics had been settling and farming in the area. The 1880 U.S. Census reported that 85% of the small community was Hispanic. When William Hudson Kirkland and James McKinney began in 1870 digging the first irrigation canal to supply water to the land south of the Salt River, Hispanics, seeing an opportunity, moved in to help with the construction. Influential Anglos like Hayden and Kirkland were known for their largesse’s like employing and often generously supporting both the Hispanic and Indigenous and populations. But with frenzied growth and activity relations between Anglos and Hispanics were often strained. Sensitive to their concerns, Kirkland was instrumental in helping the Mexican contingent create their own community. In exchange for labor constructing his canal, Kirkland donated eighty acres just south of Tempe Butte. Present day College Avenue marks the center-line of San Pablo ─ University Drive, the southern boundary. The only stipulation that Kirkland put on his gift was the income from the sale of lots must be used to erect a Catholic Church. Our Lady of Mount Carmel was dedicated in 1873 becoming Tempe’s first public building. Along with homes and the Catholic Church, San Pablo also had the Perez Saloon and stores operated by “Old Jim” Murphy, Harry Bernard and Ben Goldman. Further distinguishing the two cultures, most homes and buildings in the Anglo areas were frame or brick construction while San Pablo structures were adobe, a material much better suited to cooling during the intense summer heat. Although contributing materially to the development of Tempe, Hispanics were frequent victims of discrimination and stereotyping that lasted into the 1950’s. By the mid-20th century San Pablo had been entirely absorbed into burgeoning Tempe. 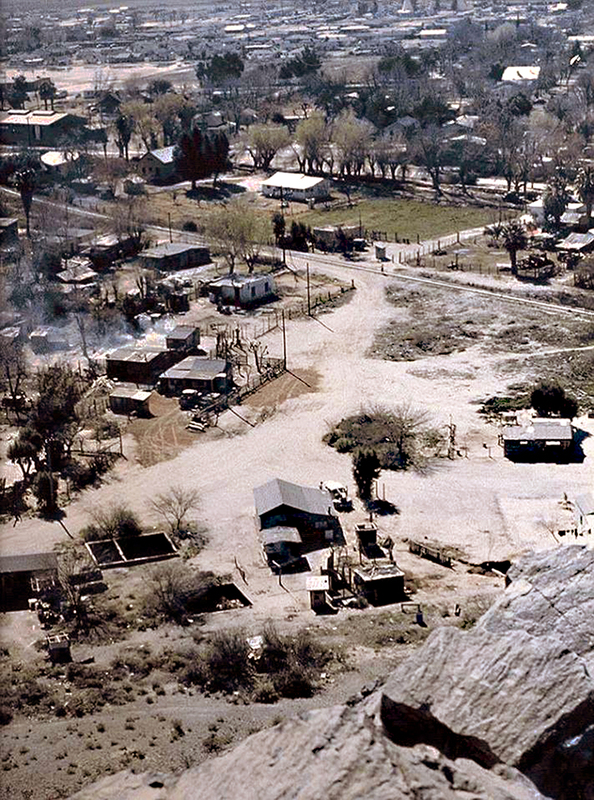 Scattered San Pablo structures lasted until ASU began expanding north of University Drive in the Fifties. Recent archeology along the Light Rail line and site of the Transit Center has unearthed new information about San Pablo ─ stories that will be told in the coming months. Today regrettably nothing remains of San Pablo ─ only the faint memory of a nearly forgotten but important part of Tempe’s Past. San Pablo as it appeared from Tempe Butte in this circa 1950 photo taken by Art Clark.